The Monster Energy NASCAR Cup Series makes its way to Kentucky Speedway for Saturday night’s (July 14) Quaker State 400 presented by Walmart. The green flag flies at 7:30 p.m. ET on NBCSN. Also, with only 0.1 points awarded for each lap led by a driver, the need for a dominator is less important when building a winning lineup. The 267-lap race will only have a total of 26.7 points up for grabs in this category. Take note when building your roster and focus on mid-pack drivers who can climb up toward the front on race day. Here are drivers to keep an eye on for this weekend's Quaker State 400, courtesy of Frontstretch.com's Corey Brewer. Unsurprisingly, Busch has the best average finish among all active drivers at Kentucky. In seven career races, he has two wins, five top fives and six top 10s. Busch's only finish outside the top 10 was a 12th-place result in 2016. Aside from that finishing position, Busch has also led more than 100 laps in four races. That total includes both his wins and a fifth-place finish last season. Add in some fiery talk surrounding Ricky Stenhouse Jr. Friday and Busch is fired up for success here. Put him on the roster. Even though Harvick has not won at Kentucky, he ranks high among all drivers in average finish. His greatest success there has come since joining Stewart-Haas Racing in 2014. In three starts before then at the track, Harvick had finishes of 16th, 11th, and 10th with Richard Childress Racing. While those aren’t bad, he is currently on a four-race top-10 finish streak while piloting the No. 4 car. He also led 128 laps from the pole in 2016 and is hungry to add a victory to his resume here. Don't let Daytona's stumble fool you; Harvick is still the best driver out there this season, especially on 1.5-mile tracks. Keselowski has the most wins at Kentucky during the track’s seven-year tenure on the MENCS circuit. He won back in 2012, then has picked up wins in every even-numbered year since. If that pattern continues, the No. 2 car would project to win this weekend. On a more serious note, Keselowski has led 60 or more laps in five of the seven races at Kentucky. He is priced well below the “Big Three” and could be an interesting pivot off the bigger names after showing consistent speed in practice and qualifying fourth. Even before picking up his first career win at Daytona International Speedway last weekend, Jones was pegged as a sneaky play for Kentucky. Now, there will be more eyes on him. Jones has all the momentum and can race more freely now after locking down his playoff spot. In his only MENCS start at Kentucky, the sophomore finished sixth last year. He also ran third in the NASCAR XFINITY Series race held the same weekend. place finishes. In 2016, he started 16th and had an eighth-place average running position. In 2017, his average running position was also strong (11th). So, McMurray did not luck his way into good finishes. He ran towards the front all race long and also should benefit this weekend from teammate Kyle Larson's 1.5-mile track momentum. Don't forget, Larson had Chicagoland in hand until Kyle Busch hit his rear bumper entering Turn 3 of the final lap. Wallace is another young driver looking to carry momentum gained at Daytona to Kentucky this weekend. He drove a torn-up race car to a 14th-place finish last Saturday, his second consecutive Daytona top 15. While Richard Petty Motorsports doesn’t have the best 1.5-mile race cars, they did finish well with Wallace behind the wheel last season. 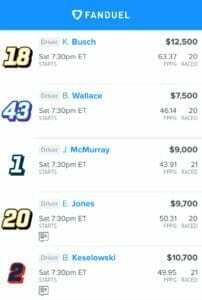 As a replacement driver for the injured Aric Almirola, Wallace finished 11th in this event. Driving RPM equipment, 11th is as impressive as winning the race. If this rookie can come close to duplicating that finish again this weekend, he will be a great value play.